Alphalite | Linear LED Vapor Tight - Contact Us Today! 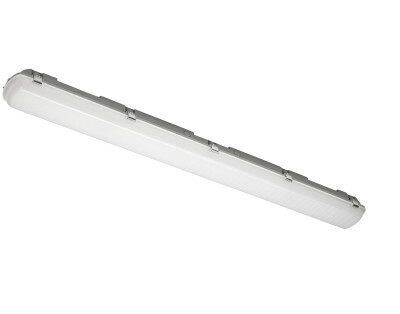 The Slim Profile Linear LED Vapor Tight Luminaire is a modern and versatile integrated LED solution that delivers long life and energy savings within a low profile design. The rugged housing and dedicated LED design offers advanced thermal management and protection against outdoor and semi-outdoor environments. Parking garage, canopy, car wash, cold storage, transportation, exterior retail and other environments where moisture or dust may be present. A rugged combination of extruded aluminum and die-cast aluminum housing withstands outdoor environments. Outer surface treated with durable powder coating to provide resistance to corrosion, rust, weathering, and UV degradation. Performance-engineered, integral heat sink provides superior thermal management for long life and reliability. Luminaire utilizes long life, high efficacy LEDs and a highly efficient, reliable LED driver. 120V-277V input voltage for increased versatility. Comes equipped with quick disconnect for compliance with US code. 0-10V dimming comes standard. Quick mounting clips included. Suitable for suspension mounting or surface mounting. Highly efficient polycarbonate lens effectively reduces LED pixelation and diffuses light for less glare. Outer surface treated with durable powder coating to provide resistance to corrosion, rust, weathering, and UV degradation.